As the saying goes: if it ain't broke, don't fix it - and the same goes for movie props. With dozens of blockbusters released every year, it only makes sense for studios and producers to reuse sets, weapons, gadgets, or props, but fans aren't usually meant to notice them. You'd be surprised to see how many of your favorite movies were filled with recycled material, but more often than not, it only makes watching them even better. 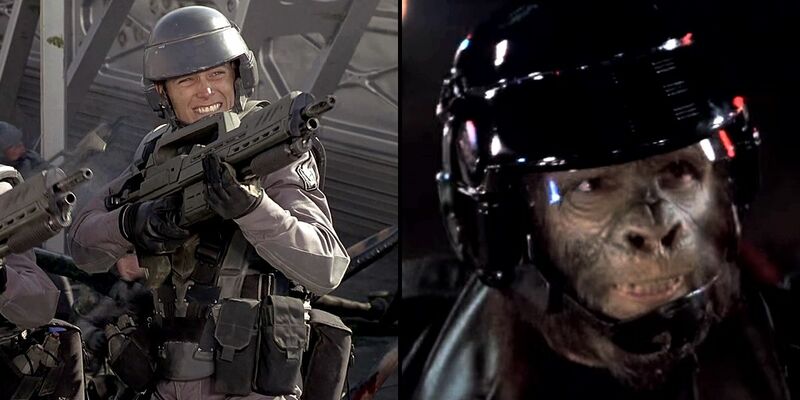 Here are Screen Rant's 10 Movies That Stole Their Props From Other Films. When a blockbuster movie deals with the US military and the men and women in service, it's not hard for a movie studio to negotiate the use of actual vehicles and aircraft. But what do you do when the military in your film is completely fictitious, based on Marvel Comics' top secret S.H.I.E.L.D.? It turns out full scale replicas of fighter aircraft aren't all that common, and even though most of the jets seen in the first Avengers are CGI, the one that Hulk destroys in his fight with Thor isn't. It's the same prop Arnold Schwarzenegger piloted in True Lies, with a new paint job (and a less glamorous role). There's a good chance that every eco-friendly fan of Back to the Future is still waiting for the invention of Mr. Fusion, the home energy device introduced at the end of the first movie. In reality, Mr. Fusion was really a Krups coffee grinder, but its sleek futuristic design made it perfectly suited for the cutting edge tech of 2015. But Doc Brown wasn't the first to put the prop to a more impressive use: the production team of Ridley Scott's Alien also found the grinder to be a vision of the future, mounting to a wall of the Nostromo space station in the movie's opening shots. And to think, some people only used it for coffee! There were lots of unforgettable moments in T2, but the Terminator unleashing a storm of lead from Cyberdyne headquarters (being careful not to hurt any humans, as ordered by John Connor). But that's no ordinary minigun he's firing: it's the exact same one that he saw up close in Predator years earlier. The original Terminator 2 script called for a smaller gun, but James Cameron was clearly a fan of the monstrous weapon, and gave Arnold Schwarzenegger a turn instead. If you look closely, you can even see where the original handle and sling were attached before they were ground off, meaning Arnold had to hold the gun's entire weight with only his arms. Somehow, we don't think that was a problem. They say that one person's trash is another person's treasure, and the first Star Wars prequel supports the claim. When the Jedi are strolling through Watto's scrapyard, you can clearly make out an EVA pod from Stanley Kubrick's 2001: A Space Odyssey, which is apparently the very same prop used in filming. Kubrick actually demanded every one of his props be destroyed to keep other studios and films from copying his look, so either the hidden Star Wars pod was overlooked, or it was just one of the hundreds of props that had to be rebuilt for the sequel, 2010. We've previously pointed out how Star Trek movies have used the exact same footage from one to the next, but this recycling job is almost too good to be true. In Star Trek: The Motion Picture, the modeling team went all out, making an impressive orbital office complex as complicated as any project before. Apparently, the team was too proud of the model to give it just one big screen appearance, too. Assuming fans would recognize the structure if it was used in the sequel, Wrath of Khan, they did what any reasonable person would do: turn it upside down, and the transformation from an office structure to the Regula One space station was complete. Physical props are one thing, but what about digital ones? Fans of Ridley Scott have imagined that both Blade Runner and the Alien series exist in the same universe, but it's a reused prop that proves the director's two greatest sci-fi stories have more in common than you'd think. When Deckard is picked up in a police spinner, the launch sequence screen is identical to the one used in Alien, when the escape pod leaves the ship. It's not the only reused footage either, and even if it was only meant to cut down costs, the recycled video provided an in-universe link that's hard to ignore. Every director has their good luck charm, from clothing, to supporting actors, and even camera tricks. But for Sam Raimi, it's the 1973 Oldsmobile Delta 88 that he drove during his college days. The large yellow car - nicknamed "The Classic" - has appeared in nearly all of his films, from Spider-Man to Drag Me To Hell and Army of Darkness. The car also made an appearance as a broken down wreck in the modern Evil Dead remake, but it's the western The Quick and the Dead that takes the cake. Raimi made sure his car would fit into the movie's Old West setting by hiding it under a complex wagon chassis, making sure it still kept the tradition alive. No matter how hard George Lucas and the Star Wars producers tried, it always seems that the smallest, most ignored characters and roles are the ones most embraced by fans. So the lineup of bounty hunters Vader assembles in The Empire Strikes Back have all earned fan followings, but the slim droid known as IG-88 has been adopted by more than almost any other. It's funny, since the character's creation was clearly a bit of a joke. When a droid bounty hunter was called for, crew just looked at the previous film's set, and used their imagination. How else do you explain the droid's head being first seen as a drink dispenser used in the Mos Eisley cantina? The Room of Requirement was a pivotal location in the final chapters of the Harry Potter series, enchanted to appear as whatever room was needed by the witch or wizard to access it. But when the filmmakers needed it to be filled to the brim with everything imaginable, they called on props from nearly every movie in the series that came before it. There's the Chinese lanterns from the Christmas party in The Half-Blood Prince, the harp Quirrell used to keep the three headed dog sleeping in The Philosopher's Stone, and a giant chess piece from the same movie. Fans can dissect every inch of the frame to find them all. Those are just some of the recycled props we caught in hit movies, but which other ones did we miss? Make sure you tell us in the comments, and remember to subscribe to our YouTube channel for more videos like this one!